It was the betrayal heard around Hollywood. On Tuesday night, Deadline reported that Quentin Tarantino would shelve his highly anticipated new script “The Hateful Eight” after word that an industry insider had supposedly leaked his script. 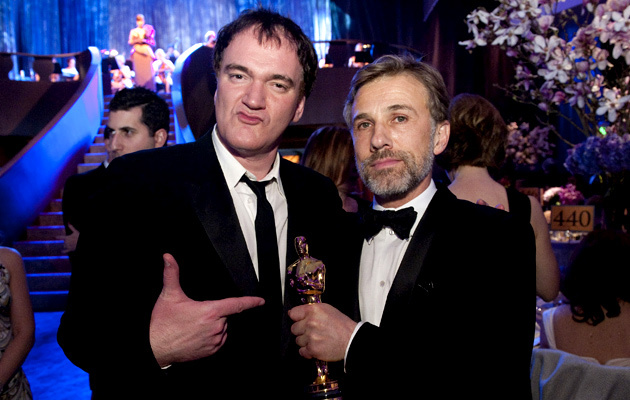 The source of the leak is still unknown, though Tarantino firmly believes that it wasn’t Tim Roth’s doing. For once, Mr. Orange isn’t the rat. According to the article, Tarantino held a secret meeting with actors Bruce Dern, Tim Roth, and Michael Madsen. He gave each of them a copy of the script and then one of them went and brought it to their agents. Then, somebody in said agency leaked the script. Infuriated, Tarantino said that he would shelve “The Hateful Eight.” Instead of turning it into a film, he threatened to have the script published instead. If it was only the script itself that we ever got to see, that wouldn’t be the worst thing in the world. Tarantino’s scripts are a wonder to read, filled with amazing descriptions and misspellings. But would you rather see the Mona Lisa, or read a rough description of it? The sense of betrayal that Tarantino feels makes absolute sense, but his reaction feels a little black and white. Quentin is an old fashioned dude who almost feels like he wasn’t made for these times. The man refuses to shoot on digital, and has basically no internet presence whatsoever. We live in a time where everything is seen and scrutinized, so having the very first draft of a script he just completed already come into attention might have been too much for him to handle. Strangely enough, this isn’t the first time that Tarantino has had one of his scripts get leaked: the same thing happened to both “Inglourious Basterds” and “Django Unchained.” Then again, those were both later drafts and when they were both leaked, the respective films were already finished or in the process of being finished. People with patience wouldn’t have read the leaked copy of “The Hateful Eight.” Its mere presence seems like good press, actually. People are talking about a film that hasn’t even been made yet. Shelving his latest script just seems like an unfair punishment. There has to be a better way to punish some Hollywood insiders than by holding all of his fans hostage. While I will try to take Quentin’s word that he might return to “The Hateful Eight,” this is the same guy who has also said that he will make “Kill Bill 3″ for the past decade. If the “Kill Bill 3″ possibility has taught me anything, it’s that Tarantino has no shortage of ideas, but he really doesn’t care when the viewer wants to see something that he has written. But I really do care, and I hope that this whole debacle can be settled and sorted out soon. “The Hateful Eight” should be the next film that Quentin Tarantino directs. It is not just because of the possible actors, as casts can change frequently (at least three actors had to drop out of “Django Unchained” because of other obligations). One can argue that Quentin has been making westerns in one form or another for his entire career. However, it is about time that he finally made a “pure” western. If he made “The Hateful Eight” next, it would serve as the final chapter of a sort of loose trilogy with “Inglourious Basterds” and “Django Unchained” in which each film moved closer and closer to being a western. “Basterds” is a war flick with western influences, and “Django” basically is a western that just happens to be set a little further east*. It is as if these two films were building up to Tarantino finally writing and directing his first traditional western. If Tarantino does decide to direct “The Hateful Eight” next, he will actually be doing a huge service to the genre that he loves so much. For years and years, people have speculated that the western of the days of John Ford and Howard Hawks is dead. Despite the huge box office success of “True Grit” just four years ago, the myth that the western is dead still stands. Quentin is known for reviving the careers of struggling actors and bringing forgotten music back into the lexicon. Quentin could definitely remind everyone that there is still profitability and legitimacy left in the western genre. Quentin is one of few filmmakers left who truly deserves to be called a genius. This is not just because of the ideas he comes up with, but also how he can make things that normally wouldn’t work actually work in the most masterful of ways. Getting screwed over by the industry that you love so much must be difficult. However, that rabid fan base that can quote “Pulp Fiction” by heart and probably owns all of the collector’s edition copies of “Reservoir Dogs”** is still there. As a fan, I will see anything with Tarantino’s name on it. Preferably though, I would like to see the product that promises a Mexican standoff between Bruce Dern, Michael Madsen, and Tim Roth. I highly reccomend that you read the full Deadline article. *Although there are parts of “Django Unchained” that take place in Texas and some other parts of the western United States. Whether it is truly a western is up to interpretation. **For the record, I own the copy with the Mr. Blonde cover. This entry was posted in Uncategorized and tagged Bruce Dern, Django Unchained, Michael Madsen, Quentin Tarantino, The Hateful Eight, Tim Roth, Western on January 23, 2014 by ian0592.